Every so often, a little known band comes out with an album which begs one to question how they remain in such obscurity. 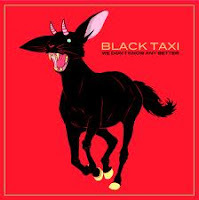 Black Taxi's second, We Don't Know Any Better is one of those records. Having already made a name for themselves on New York's underground circuit, the Brooklyn quartet excelled on debut set Things Of That Nature, playing a brand of indie pop which was vibrant, exciting and at times sensational. Even more impressive, though is the extent to which this sophomore betters it's predecessor, showcasing the rapid progression of this excellent group of musicians and displaying just why they're one of the most exciting bands currently doing the rounds. There are no drastic changes, heightened ambitions nor brilliant individual or collective improvements apparent here. Really, all that this record's excellence has resulted from is the band polishing up each and every aspect of their sound, and in doing so conjuring some of their finest and most engrossing songs to date. The record's sound derives from a wide variety of sources, so much so that it could almost be seen as an ode to some of the best indie pop that's surfaced in the past decade. Franz Ferdinand's seductive swagger is evident throughout, as is the effortless cool of latter day Belle & Sebastian, with shades of The Shins and even hints of MGMT's wandering psychedelica also making an appearance. Don't begrudge them for these similarities, though, as they toe the line in the best way possible, with a group of songs that any of the aforementioned bands would be proud to put their name to. Nowhere is this more true than on the title track, an irresistible slice of noughties dance-punk which displays practically every positive trait that Black Taxi have in their armoury. Less than a fortnight into 2012, it can genuinely be stated that you'd be hard pushed to find a more addictive song all year, and along with the splendidly streamlined lead single and opening track 'Tightrope' it makes for a truly wonderful start. Although not always to such a high standard, there are other similarly fabulous moments, such as the startlingly simplistic yet melodically perfect 'Friend,' and the spellbinding loops of 'Tell Me What You Need,' but ultimately every song here is front loaded with astoundingly catchy guitar hooks which are simply guaranteed to pitch their camp in your brain's jukebox. Even chilled closer 'Hope I Never Know,' which stands out like a hipster at a Britney concert can be forgiven for betraying the flow purely on the strength of it's chorus, which provides one last moment of bliss for which the album can be remembered. Indeed 'memorable' is an adjective which complements this record perhaps more than any other, such is the strength of it's appeal. These aren't songs written by your average band from New York's underground, these are masterful and sophisticated nuggets worthy of some of the best releases of the year, and barring something spectacular We Don't Know Any Better will be right up there in the indie-pop stakes in eleven months time. Unbelievably catchy from the offset, it's a record that pulls you in on first listen and only strengthens it's grip with repeated spins, and ultimately is one deserving of so much more attention than it will inevitably receive. We Don't Know Any Better is released on Saturday (January 14th). If that's too long to wait, 'Tightrope' is available as a free download from their Bandcamp page.